Spinal Tap are known for plenty of things, from the backstage antics of This Is Spinal Tap to their tiny Stonehenge stage props. Still, their greatest gift of all is arguably their amps, which have knobs that go to 11 instead of the customary 10. The running joke has followed Spinal Tap everywhere, even into their well-publicized lawsuits. There has also been an 11 gag hiding in plain sight all this time on the movie's IMDb page. Specifically, its score is ranked out of 11 instead of 10. The joke has been on its IMDb page for at least a year, although Redditors tend to love talking about it when they discover it. It's certainly a fun gag, but there's a downside — it means This Is Spinal Tap is actually ranked far lower than one might expect on IMDb. 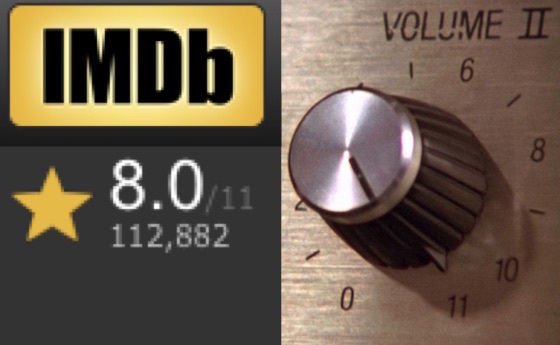 After all, if the 8/11 fraction was converted to the standard rating out of 10, the movie would be sitting at a 7.3.